New titles from Arbordale Publishing have joined the children’s collection in the LuEsther T. Mertz Library! The titles featured below offer a perfect balance of education and entertainment with colorful illustrations, engaging storylines, and learning activities. All new titles are available for check out for library cardholders. Jojo and her family have always welcomed bats into their barn. It was not until a newspaper published a story about a disease that effected bats called white-nose syndrome that Jojo and her family decide to become citizen scientists and conduct a bat count. Throughout the years, they have noticed a drop in the number of bats they spot flying around their barn. 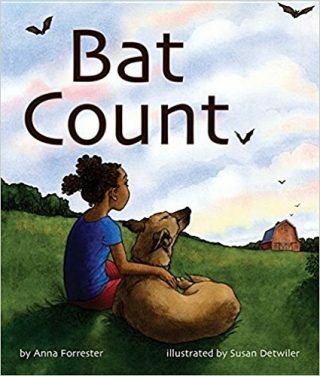 Bat Count: A Citizen Science Story invites readers for an evening bat count with Jojo and her family. Read about bat facts, white-nose syndrome, and how to become a citizen scientist in the additional pages toward the end of the story! Bat Count is one of the selections for the National Science Teachers Association 2018 Outstanding Science Trade Books, as it is a wonderful way to encourage middle grade readers to explore and engage in science for fun. If you do not have the opportunity to observe bats near your home consider taking a bat walk! Last autumn, staff at the NYBG Everett Children’s Adventure Garden hosted bat walks in collaboration with the Organization for Bat Conservation. Join us at future events! In the meantime, check your local bat or wildlife organization to find bat walks in your area. 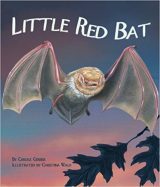 Little Red Bat by Carole Gerber is a tale of uncertainty and making informed decisions. The illustrations by Christina Wald allow the readers to experience the story from the perspective of Little Red Bat. See all of the other animals up close in their habitats. Winter is coming and Little Red Bat is not sure if she should stay in her tree or migrate elsewhere. Where can she go if she does not stay? Little Red Bat talks with a mouse, a turkey, a deer, and many other animals to see what they plan to do for the winter. Taking into account all of the advice and warnings Little Red Bat receives from the others, she makes her decision—find out what Little Red Bat decides to do! Little Red Bat is a great way to introduce young readers to animal habitats, migration, and relationships. Winter is approaching and Kate is concerned about her garden. How will her flowers survive the cold? Kate transplants her flowers into pots and moves them into her home, quickly filling the house to keep them safe from the elements. But there is just one problem—her dad is allergic! After several sneezes, Kate knows that she will have to move the flowers out of the house, but finding places for them will not be easy. 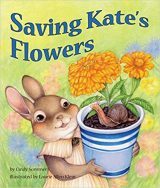 Young readers will enjoy Kate’s attempt to save her flowers as it provides a fun and easy introduction to seasonal gardening. Travel by wind with Daisylocks, a daisy seed, to a range of environments in search of the perfect place to thrive. 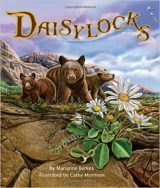 Daisylocks is a botanical take on the classic tale of Goldilocks, applying the trope of a place being “just right” to give a plant the best growing conditions. As Daisylocks explores dry, cold, and wet regions, the detailed illustrations by Cathy Morison offer readers a glimpse into the unique ecosystems for each of the areas. Use each page as a chance to engage your reader to observe and describe various fauna, flora, and landscapes. Toward the back of the book, readers will find additional information on plants and habitats. Participate in the interactive activities offered at the end of the book to help connect the story to scientific concepts! 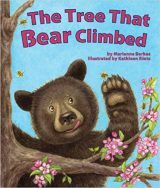 The Tree That Bear Climbed is a wonderful way for young readers to learn about the parts, lifecycle, and ecosystem of a tree. The repetitive narrative helps readers to follow the building plot, while the illustrations throughout the book begin up close on specific areas of the tree and zoom out to reveal the whole scene. Toward the end of the book, you will find additional information about plants and ecosystems as well as a hands-on experiment and an activity related to the story suited for comfortable readers. Have you ever wondered why birds create different nests from one another? The Best Nest offers an insightful discussion of why each nest is unique in its own way. Maggie Magpie makes wonderful nests and all of the other birds have asked her to share her technique. As Maggie Magpie shares her secrets to make the best nest, she notices others leaving before the lesson has finished. Each bird goes to create their own nest and each is distinctively different from the next. 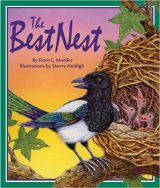 The Best Nest is a fantastic story to encourage young readers to practice spotting and identifying birds’ nests in all seasons!